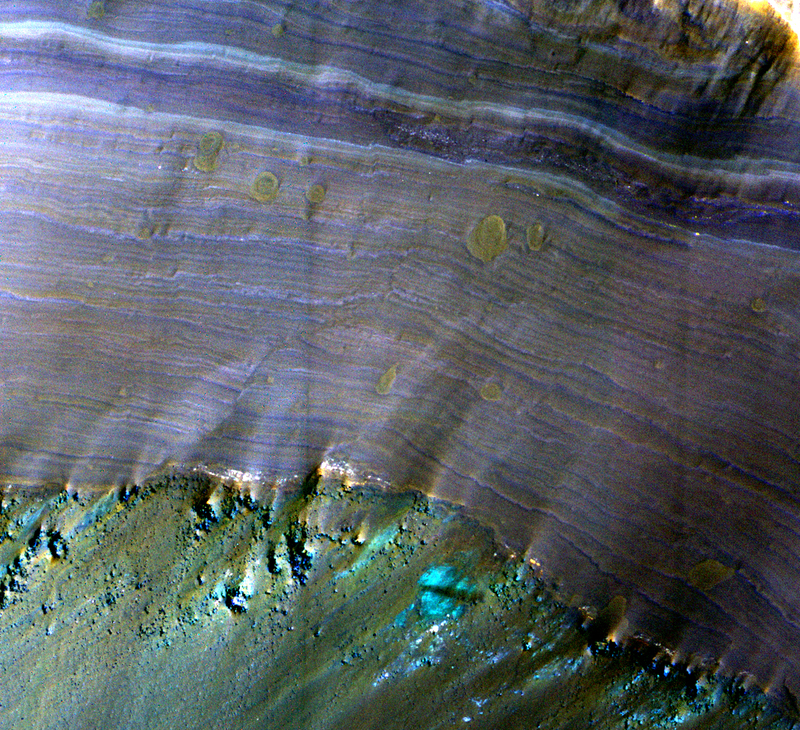 This image from NASA's Mars Reconnaissance Orbiter is of Saheki Crater, about 84 kilometers across, and located in the Southern highlands of Mars, to the north of Hellas Planitia. It's filled with beautiful alluvial fans that formed when water (likely melting snow) carried fine material, such as sand, silt and mud, from the interior crater rim down to the bottom of the crater. Two smaller craters impacted into the alluvial fan surface in Saheki, excavating holes that allow us to see what the fans look like beneath the surface. Exposed along the crater's interior walls, we can see that the fan is made up of multiple individual layers (white and purple tones in the enhanced color image) that were deposited on the floor (the green and brown tones). The brown, circular shapes on the fan layers are small impact craters. This is a stereo pair with ESP_049528_1585. The map is projected here at a scale of 25 centimeters (9.8 inches) per pixel. [The original image scale is 26.2 centimeters (10.3 inches) per pixel (with 1 x 1 binning); objects on the order of 78 centimeters (30.7 inches) across are resolved.] North is up.